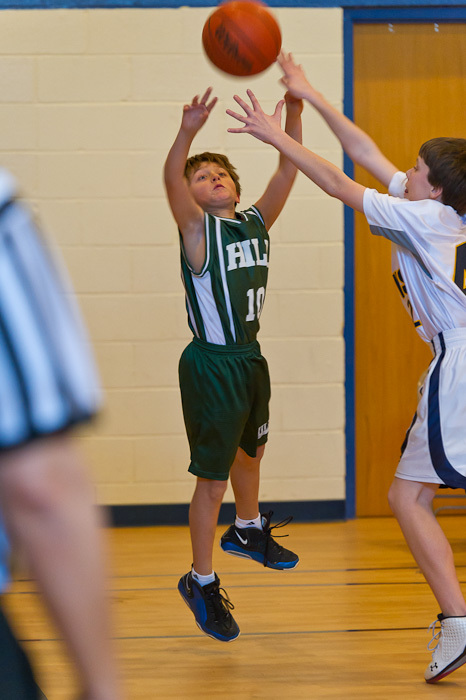 The Hill School sixth-grade basketball team traveled to Highland School in Warrenton, Virginia, today for their third game. Confidence was higher since their come-from-behind victory over Powhatan last week when Cameron had the winning shot. So, I wasn’t surprised to see the Hill team playing more aggressively, with improved blocking many more shots taken and even a few steals. They took the lead and never looked back, taking the game by a score of 21-12. It was challenging to keep up with the action, and I tried some new locations in the gym to experiment with angles and work to capture more facial expressions from our offensive players. I have some work to do to improve, but I have a few more chances this season. I actually wasn’t planning to attend this game due to a few upcoming deadlines, but when I received a call from Cam at noon saying, ” ‘We’ forgot to get my basketball uniform out of the dryer,” I became an integral part of the team. I’ll admit it was a good excuse to escape my computer for a couple of hours, but next time I’ll be sure to check the laundry room before we leave for school on a basketball day.